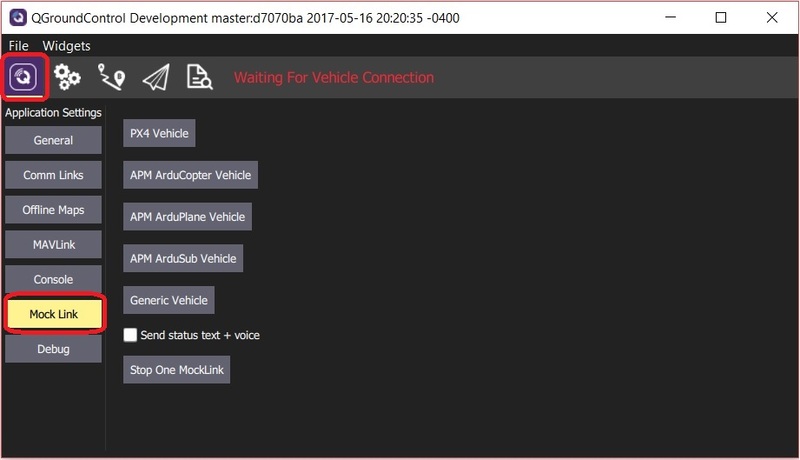 Mock Link allows you to create and stop links to multiple simulated (mock) vehicles in QGroundControl debug builds. It is particularly useful for unit testing error cases for mission upload/download. Create a debug build by building the source. The buttons in the panel can be clicked to create a vehicle link of the associated type. Each time you click a button a new connection will be created. When there is more than one connection the multiple-vehicle UI will appear. Click the Stop one Mock Link to stop the currently active vehicle. Using Mock Link is then more or less the same as using any other vehicle, except that the simulation does not allow flight.